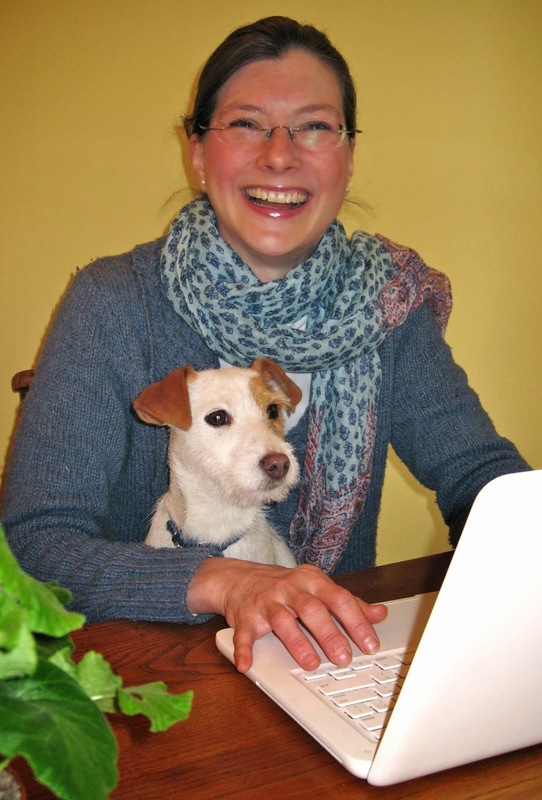 Editors often talk about voice and prose that really sings, characters that are memorable, and plot twists that stick with readers. But WHY do these elements really stand out? 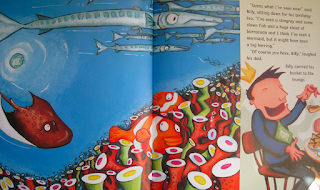 What is it that makes a particular text jump out at an editor or agent as opposed to getting the ‘So what?’ treatment? 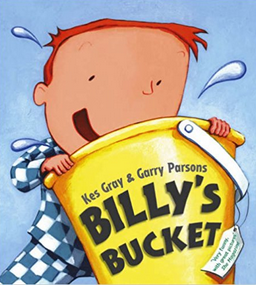 For instance, in Kes Gray’s bestselling book BILLY’S BUCKET, illustrated by Garry Parsons, Billy wants a bucket for his birthday. 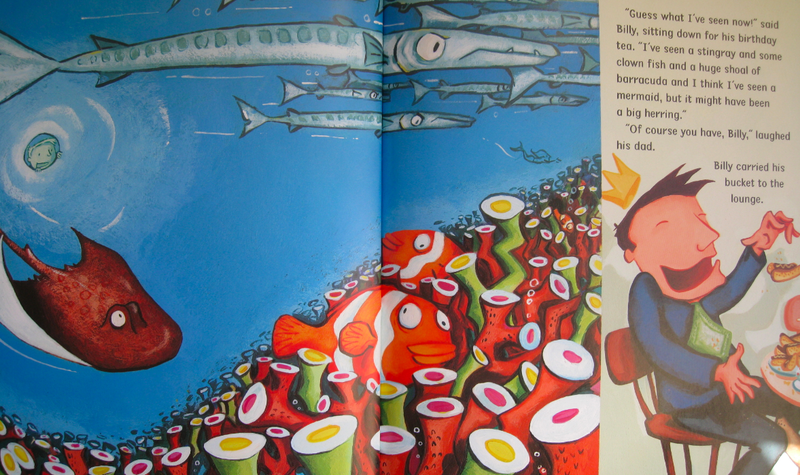 This in and of itself is a bit bonkers and totally memorable. 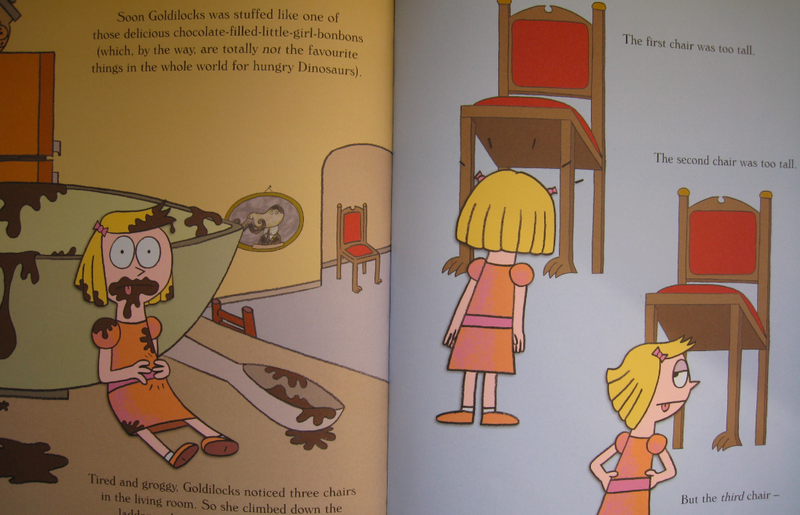 The person reading thinks, “Huh, why a bucket?” You have to read the book to find out. 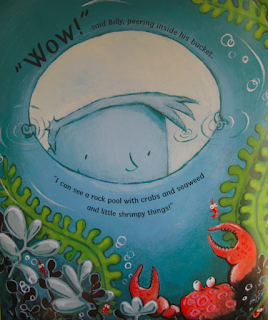 Billy doesn’t just see a bunch of sea creatures in his bucket. He sees SPECIFIC creatures. 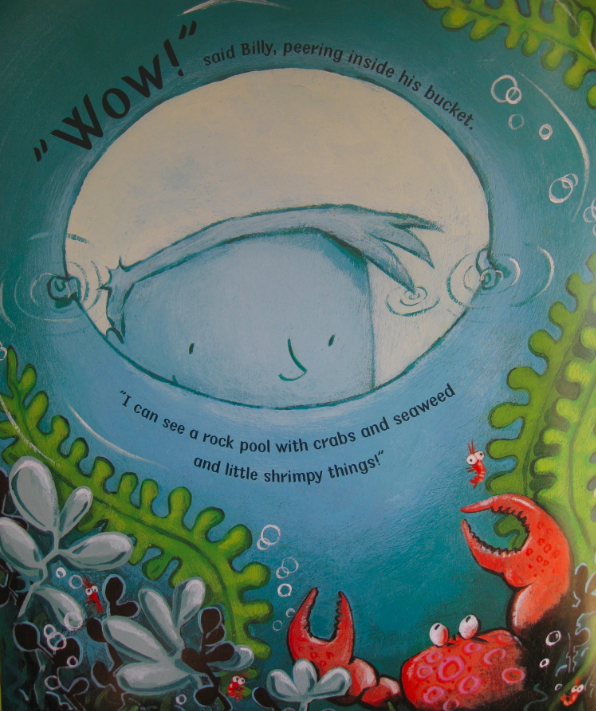 He fills up his bucket and says, “I can see a rock pool with crabs and seaweed and little shrimpy things.” This voice sounds just like a child’s, doesn’t it? Aren’t you hooked? 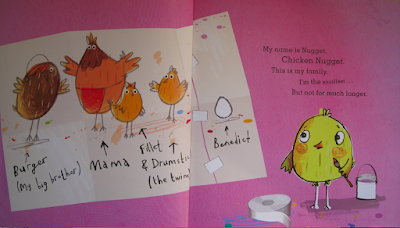 She has created a chick character who is called ‘Chicken Nugget’. The brothers are called ‘Burger’ and ‘Fillet Drumstick’ – I’m laughing before I’ve even begun to find out what the story entails! The choice of names is SPECIFIC and conjures up fun associations. On spread 2, we find out that the baby egg, Benedict, will be hatching soon and that his big brothers aren’t very impressed. “Benedict can hear EVERY word,” Mum warns. 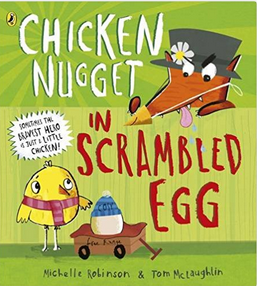 This, too, is an intriguing (and funny) premise – the egg is a living, being thing that is already part of the family. It deftly sets up the possibility of lots of things that can go right, or wrong, as a result. When Chicken Nugget tries to be kind to his baby brother, the author chooses a SPECIFIC example of how this plays out. 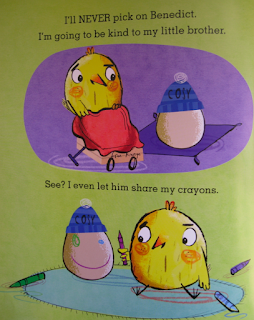 Chicken Nugget decides to let Benedict share his crayons (e.g. he draws a face on him). It is funny – and memorable. 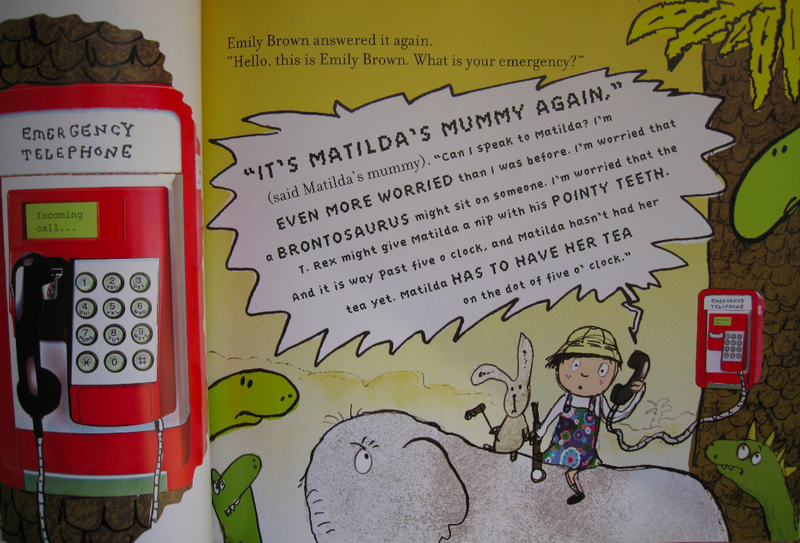 In her adventures, Emily Brown is always off somewhere SPECIFIC in her play. 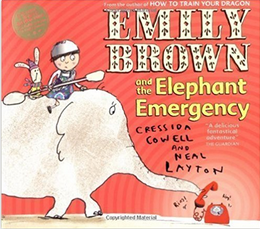 In the opening scene of EMILY BROWN AND THE ELEPHANT EMERGENCY, they aren’t playing explorers or similar, Emily Brown and Stanley are "whitewater rafting down the turbulent waters of the Zambezi River with their great friend Matilda". And Matilda’s mummy isn’t just worried about her, she’s worried about SPECIFIC things, like not having her "nice clean socks" and "getting frostbite on her trunk” or that “a T. Rex might give Matilda a nip with his pointy teeth”! 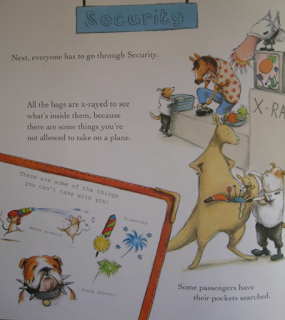 Together, all these details add up to create a rich fabric of narrative, character and setting that are such a pleasure to read aloud to a young child! The pre-school market is cluttered with books about diggers, firemen and first experiences. 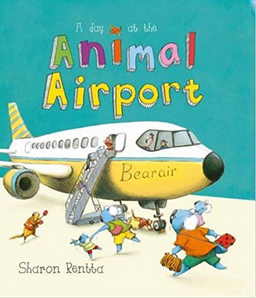 But in A DAY AT THE ANIMAL AIRPORT the author/illustrator Sharon Rentta creates such a vivid, funny, textured world that it is a delight to young readers discovering how things work for the first time! 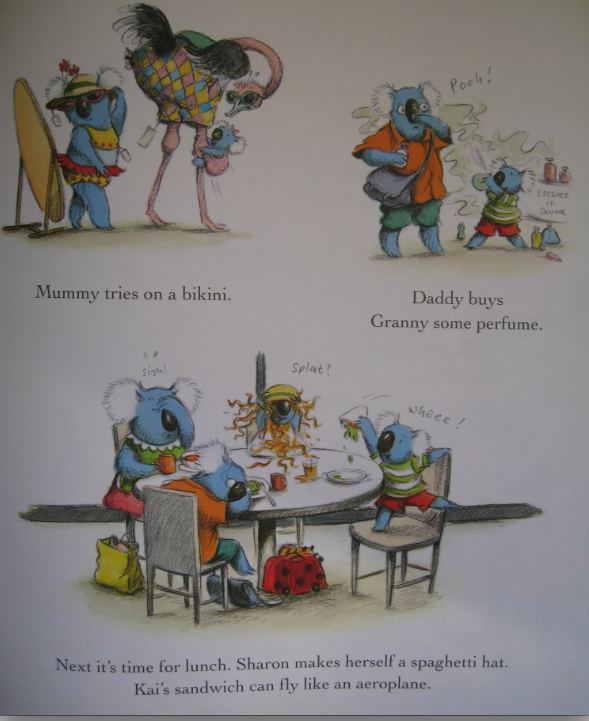 While waiting for their flight, “Mum tries on a bikini”, “Sharon makes herself a spaghetti hat” (note she doesn’t spill spaghetti all over her head or make a huge mess, she makes a ‘spaghetti hat’! ), and Kai’s sandwich “can fly like an aeroplane”. 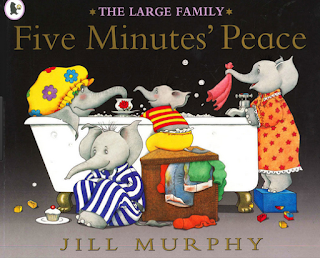 Will you remember these funny, poignant vignettes because they are so SPECIFIC? YES! 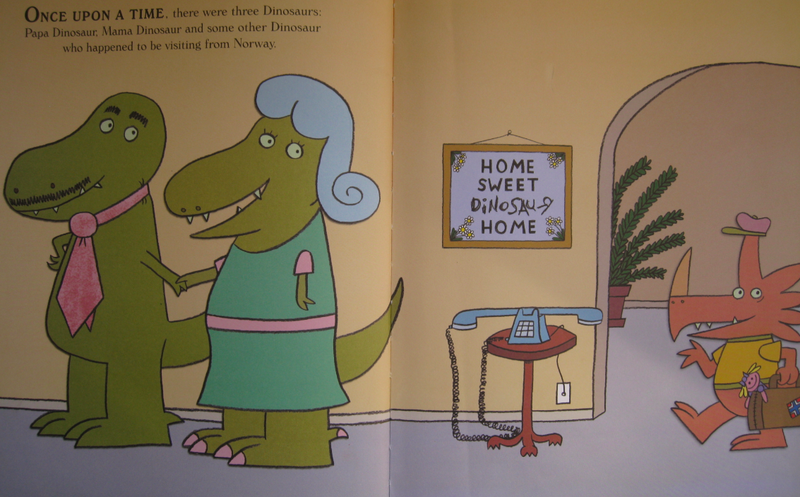 the author turns the traditional tale on its head by replacing the three bears with "some dinosaurs (one of whom happens to be visiting from Norway)". 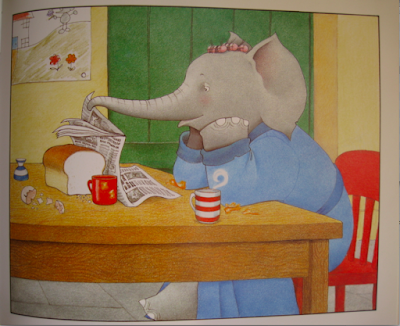 The yummy bowls are way up at the "top of that counter" (Goldilocks needs a ladder!). ALL the chairs are "too tall" . . . The beds are "gigantically big". Plus Willems adds a further twist to the story by replacing the porridge cooling in the bowls with irresistible "chocolate pudding". 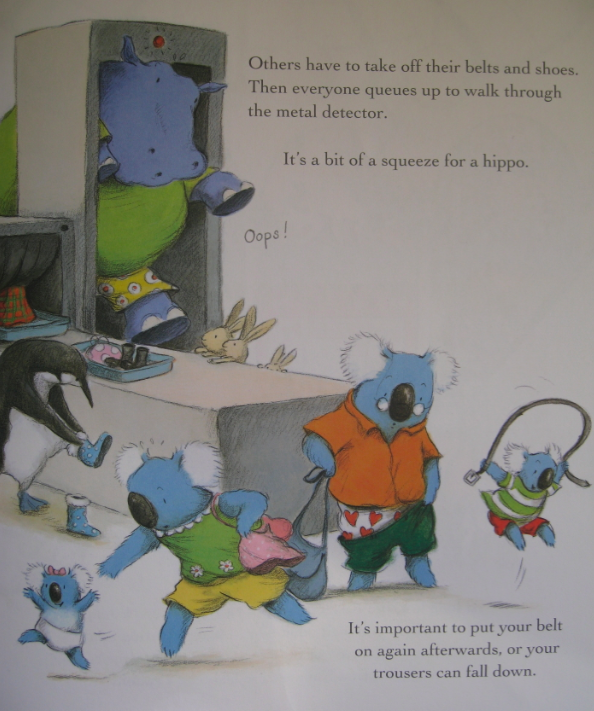 All these SPECIFIC turns of phrase and details add up to create a story that is hugely amusing and original. In Jill Murphy’s classic FIVE MINUTES’ PEACE, Mrs Large is on a quest to enjoy five minutes to herself away from her three little ones. 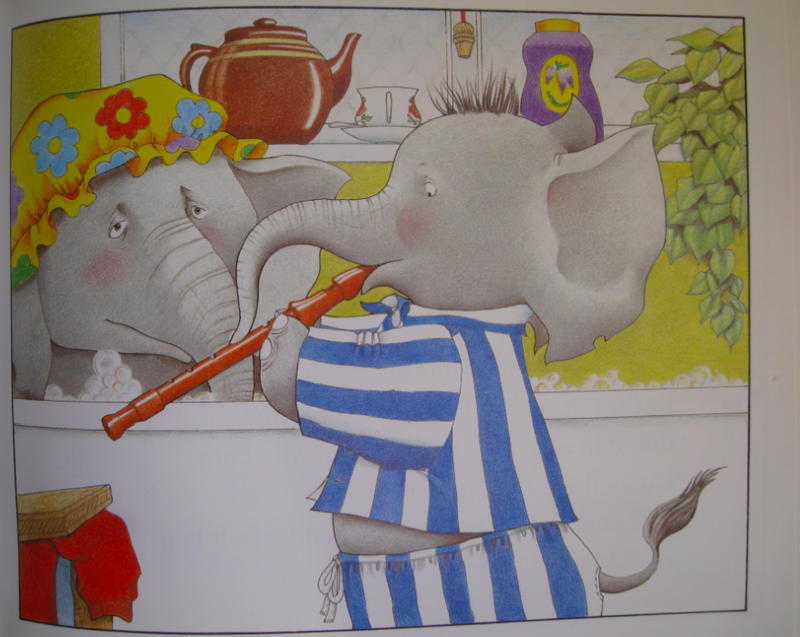 She prepares a tray of tea and cake, runs a lovely bubble bath and sinks into it. 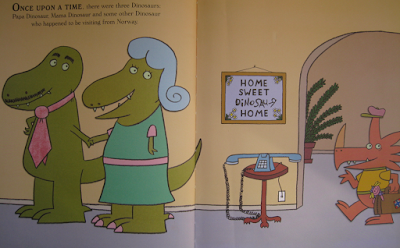 Of course, she is promptly interrupted by each child. Here, the author doesn’t say the child interrupted her or that Mum is annoyed. 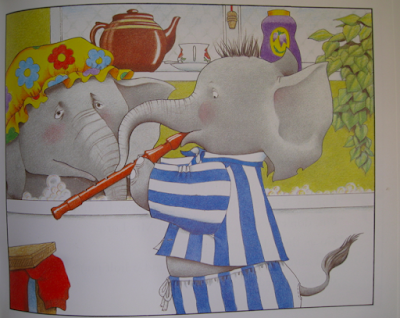 Instead, each instance is made poignant by a SPECIFIC example of how the child asks for a bit of Mum’s time: Lester says, “Can I play you my tune?” (on the recorder); Laura wants to read a page from her reading book; the little one ‘gives’ Mum a "trunkful of toys" and flings them on top of long-suffering Mrs Large in the bathtub. 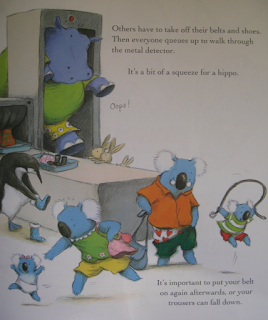 Finally, all three children get in the bath (the little one in his clothes!) 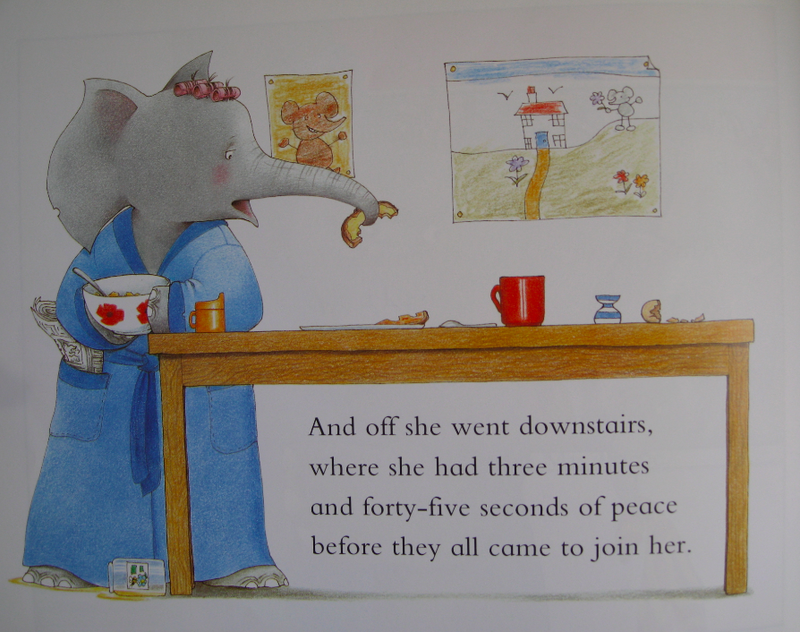 – and Mrs Large gets out and seeks respite at the breakfast table . . .
. . . where she gets “three minutes and forty-five seconds of peace before they all came to join her.” The SPECIFIC wording of the time in the punchline is a nod towards the refrain and functions artfully as the cymbal crash after the drum roll – this is what it’s like to be Mum. 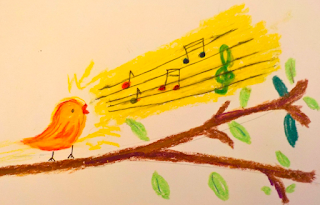 Whether you’re considering your premise, your characters, your plot or editing the fine elements of your prose, think about whether you can make what you’ve written more SPECIFIC, more detailed, more memorable, more poignant, just MORE. This does not mean cluttered or fluffed up with extraneous details, for every word must still count. Try it! 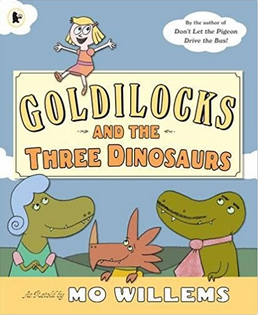 It could make the difference between a mediocre picture book and one with voice and verve. Thought provoking and useful, I'm just about to work through a text of mine again so shall be employing some of these tips. Glad you found these tips useful, thank you! Thank you. That's a useful reminder for what I'm just about to work on! This is excellent! Thank you Natascha and Ellie! This is brilliant. Thank you so much for the tips!